Noelle Clark takes readers on a brilliant escape to Capri with this lovely contemporary story. I would have liked to read an excerpt from her mystery novel as it sounded like it would be a delightful story. Sarah is a strong, multi-layered heroine and I enjoyed watching her meeting the new person she was becoming. Pietro is the epitome of a gorgeous Italian and to me I sometimes thought he was a little too good to be true I honestly kept expecting him to surprise me. I wonder if this says more about me than the book but with the romantic suspense tag I kept waiting for the unexpected. This was more a story of self-discovery than a romantic suspense but it was enjoyable none the less. I enjoyed the supporting characters and the gorgeous descriptions. This was a very budget-friendly way to visit one of the world's most beautiful destinations. I had no trouble feeling as if I too were cutting across the water to discover a hidden treasure or winding up a precarious road to reach my future. buried treasure. But will the past ruin her bright new future? When life seems to take a sudden turn in Abbie's life, it will take faith and an open heart to see her through. She leaves her teaching post traveling to Cambodia and a position in an orphanage. In Let Angels Fly set in an exotic location takes the reader into a story that is more than love and melodrama. Action and intrigue, friendship and heart throbbing moments complete the heroine's need to find her footing. Throughout this story, there were countless examples of colorful glorious writing, filling the pages and my imagination of the lush Cambodian places Abbie visited. Craig. He is far different type of man, one who can help her on her journey. One who doesn't give up what he feels easily. A mystery. Sometimes, when people are freed from old cubbies, freed from expectations, they are free to becomesomeone new. And that is key for this heroine's path. But this isn't just a love story, for things do get dark in paradise when Abbie is a witness to a crime. Basically she held against her will, with no one to turn to, until she finds Craig has not deserted her. He actually arrives and is able to free her even though he is seriously injured. In turn they perhaps learn to trust each other for neither perishes but I can't very well spoil the fun. Safe to say medical care is critically required and obtained. This is the type of story that reminds us that life holds many surprises, some coming at us when least expected. This isn't a fast food version of life, but one told with lyrical sweetness, petal by petal unfolding. There are numerous messages to enjoy such as if we are willing to take a chance, life may be imperfectly perfect and positioned to let us leapt. themselves and draw you further into the story. The romance between Abbie and Craig is just divine. raiders while visiting some historical sites. Romance, exotic adventure, intrigue - I highly recommend this light and entertaining read. DiamondDream said: What a read! Such a fabulous read... Action, intrigue and romance - all set in such an exotic location. I hope she writes another book soon, I'm hooked! Ceeelle said: New life and love in paradise. Seems it is never too late to follow a new direction in life to discover love and fulfilment. Abbie thought that she had reached her use-by date. But, in exotic Cambodia, she finds adventure, acceptance and the love of a vibrant, desirable man. I really enjoyed this story and look forward to the next novel by this promising author. 4 star review. Dragonballs3 said: True chicken soup for the soul! 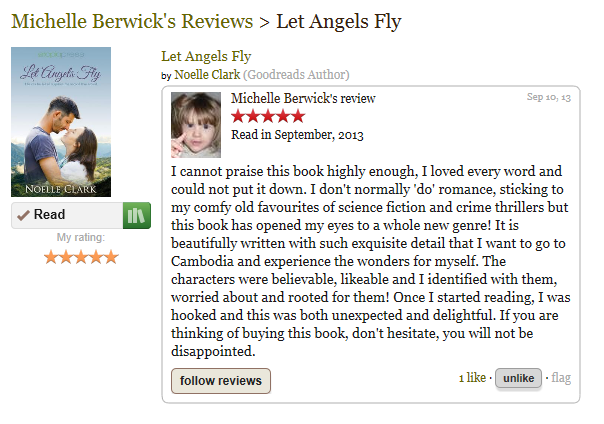 I've just finished the wonderful, "Let Angels Fly," At $5.99 it's a bargain! With suspense, romance, mystery and a belief in second chances; it was true chicken soup for the soul. Terry Faith said: Don't let the Romance tag turn you off. This is a good suspense story, set in a most unusual location - happily I have been to Cambodia myself. The author re-created it well, especially describing the local people. I felt like I'd traveled there again. temples in Noelle's book I simple have to go there. Right from the first page I was engrossed in the story. With a mixture of suspense, history, unique scenery and romance this book is a must read. I loved it and can't wait for Noelle's next book. 4 star review.